………………………………………………. 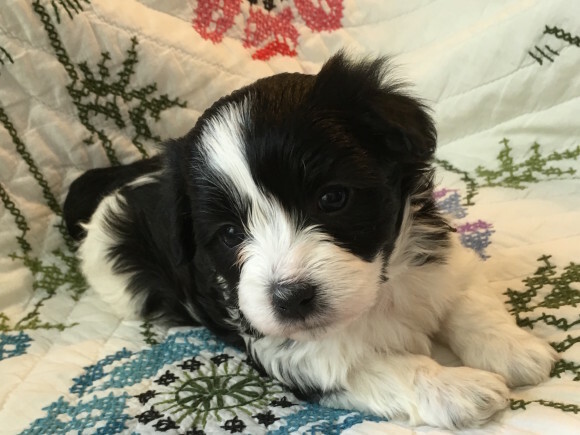 Click Links below to see puppies who live with their “Forever Families”! 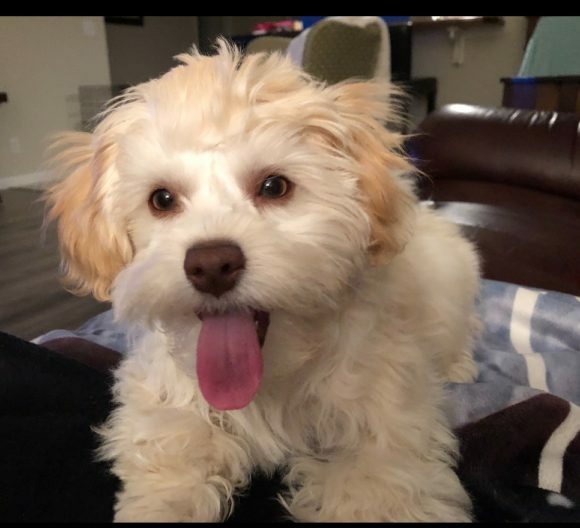 ....................................................... Click Links below to see puppies who live with their "Forever Families"! 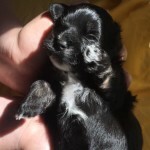 — Comments Off on Beautiful Baby Bella from Lucie’s third litter is RESERVED! 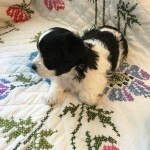 Beautiful Baby Bella from Lucie’s third litter is RESERVED! This beautiful female is now four weeks old. 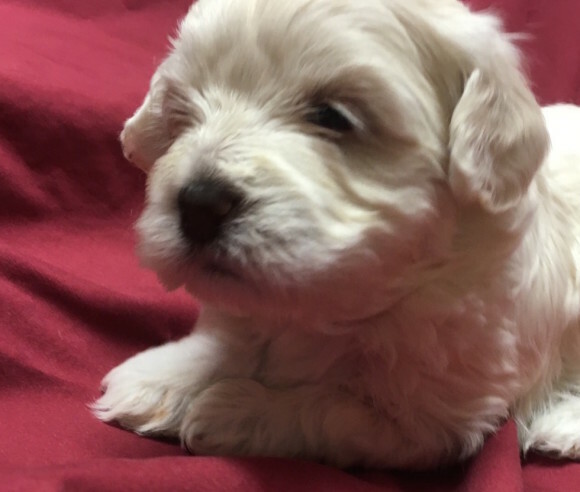 She is eating puppy mush four times a day and nursing well. She loves to play with her litter mates and older sister. She has been seen to use her potty pad, but that was coincidence. She will slowly begin to learn to to there for potty. 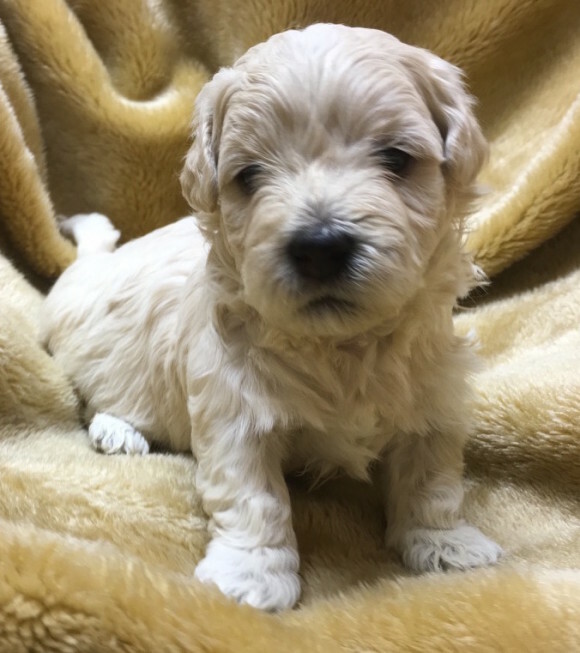 She will be ready to travel to her new home in FIVE weeks!! 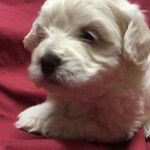 ....................................................... Click Links below to see puppies who live with their "Forever Families"! — Comments Off on Ellie’s boys- Champ & Scooter- are AVAILABLE! 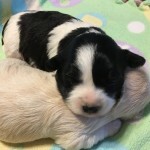 Ellie’s boys- Champ & Scooter- are AVAILABLE! Scooter, the white with cream highlights. 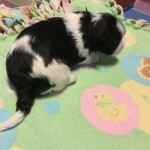 Brother, Tux, black with white chest, toes and chin is also RESERVED. 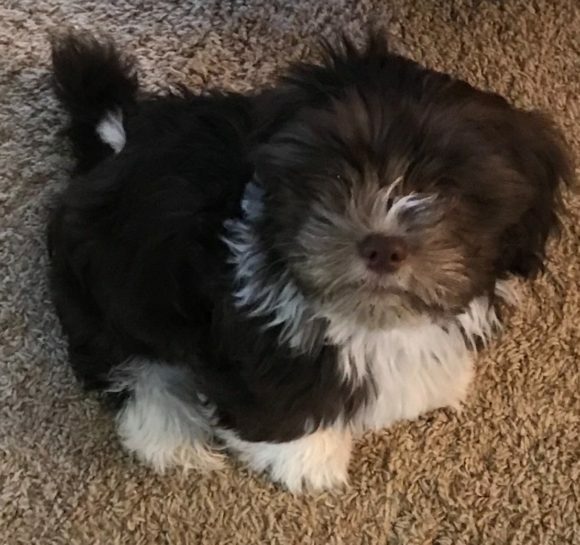 He will be called Louie! 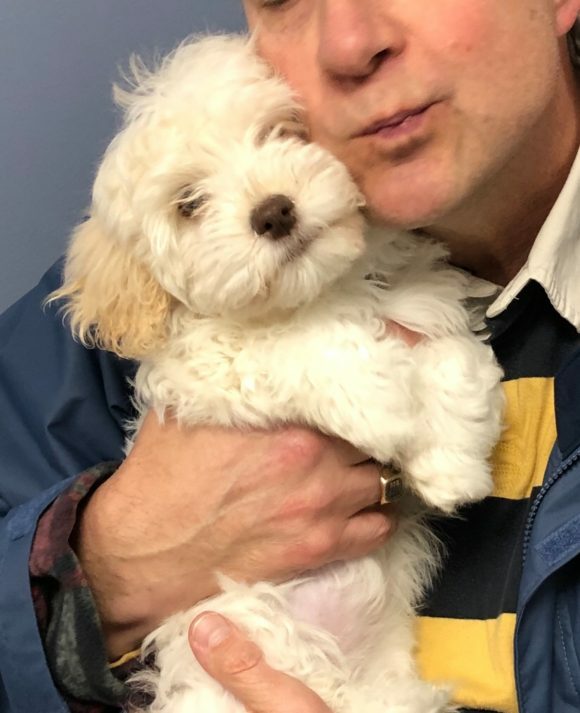 Because we have several inquiries, we can not hold a pup without a $500.00 deposit. 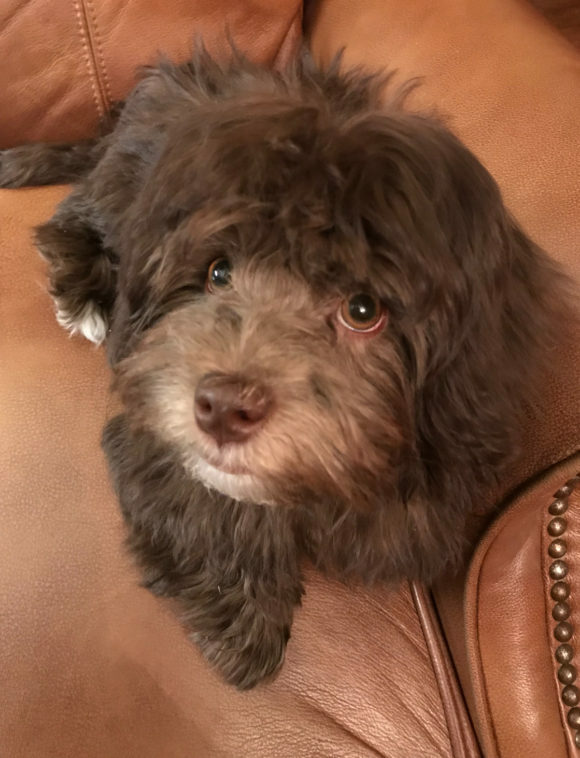 Give me a call at 314-772-4874 so that I can answer all of your questions about Hush Harbor, our procedures and our pups! 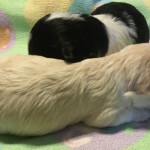 ....................................................... Click Links below to see puppies who live with their "Forever Families"! 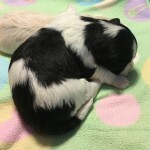 — Comments Off on Lucie’s Litter- 3 weeks old- is nearly ready to be moved from their whelping pan. Lucie’s Litter- 3 weeks old- is nearly ready to be moved from their whelping pan. 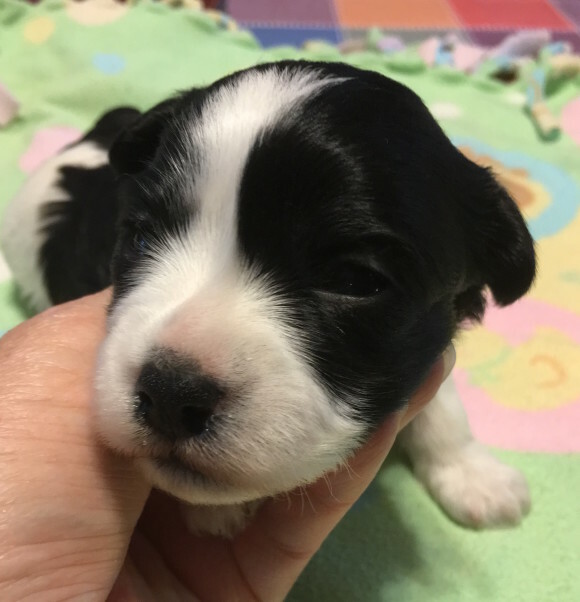 Our puppies open their eyes at about 10 days and “get their legs” soon after. This means that they spend a little more time, each day, navigating around their warm clean whelping pan. It doesn’t take much to wear them out, and so they still spend the majority of their time nursing and sleeping. By the end of the third week, they begin to have spurts of energy. They move more quickly, they make expressive noises and they relate to each other in new ways. It’s a difficult call as to when to move them to their new situations because they seem to be bored one moment and then, sure enough, they pass out. 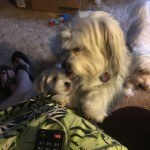 I have learned that any change creates stress for the pups. So, I will take my time and be sure they are ready before I change their setting. 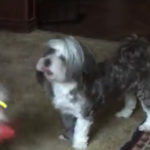 But get ready- once they begin to move around in their Puppy Palace, it REALLY gets fun here at Hush Harbor!! 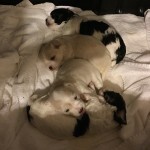 Three of these four pups are RESERVED. 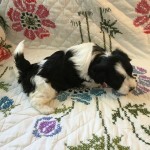 Only the Black & White female from this litter is AVAILABLE. 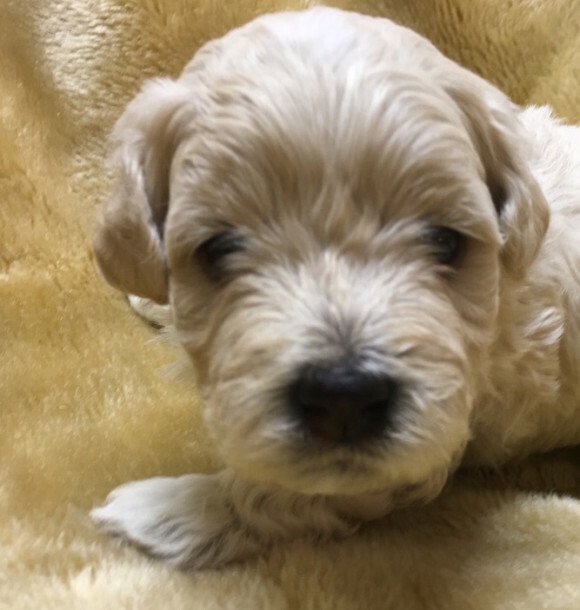 ....................................................... Click Links below to see puppies who live with their "Forever Families"! 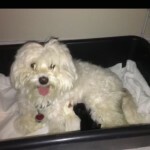 — Comments Off on Only one female pup left- Bella from Lucie’s Litter. 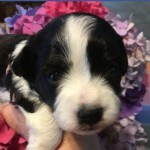 Only one female pup left- Bella from Lucie’s Litter. 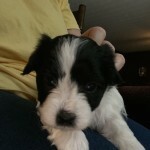 This sweet little girl will most likely remain Black & White Irish Pied. She is now 17 days old and becoming quite able to crawl and slow walk in order to find her Momma!! She is a beautiful little gal! 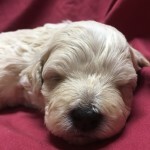 ....................................................... Click Links below to see puppies who live with their "Forever Families"! 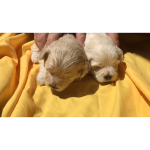 — Comments Off on Ellie & Choco’s litter is 9 days old. 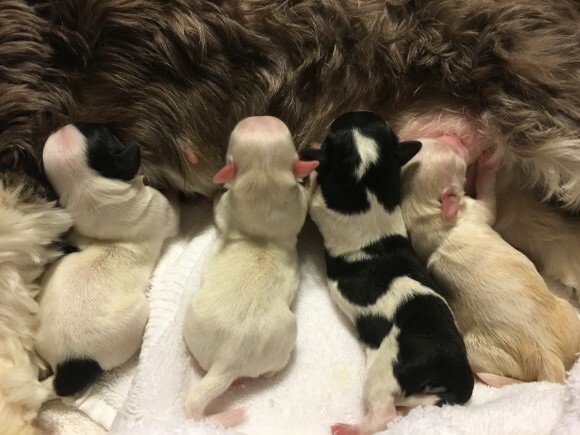 Ellie & Choco’s litter is 9 days old. 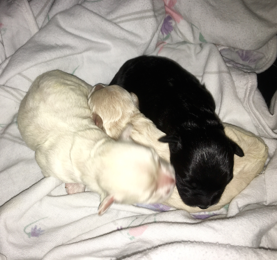 All three males are AVAILABLE. White with cream highlights, Scooter. 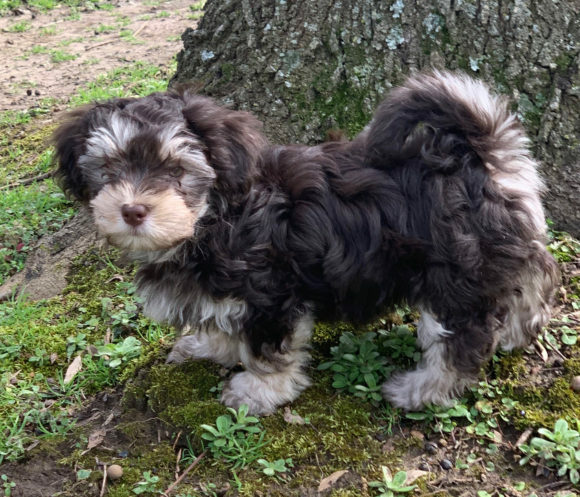 ....................................................... Click Links below to see puppies who live with their "Forever Families"! 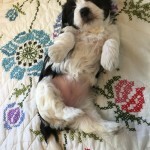 — Comments Off on Lucie’s Memorial Day Litter is beginning to open their eyes!! 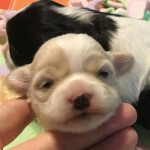 Lucie’s Memorial Day Litter is beginning to open their eyes!! 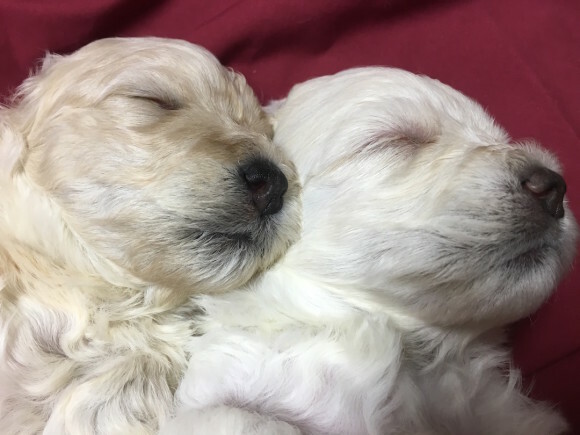 SORRY- only one of these pups is still AVAILABLE! 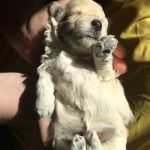 Hers were the first eyes to open of the litter! 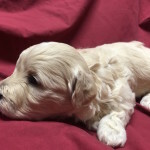 Her coloring is a warm champagne with white markings. 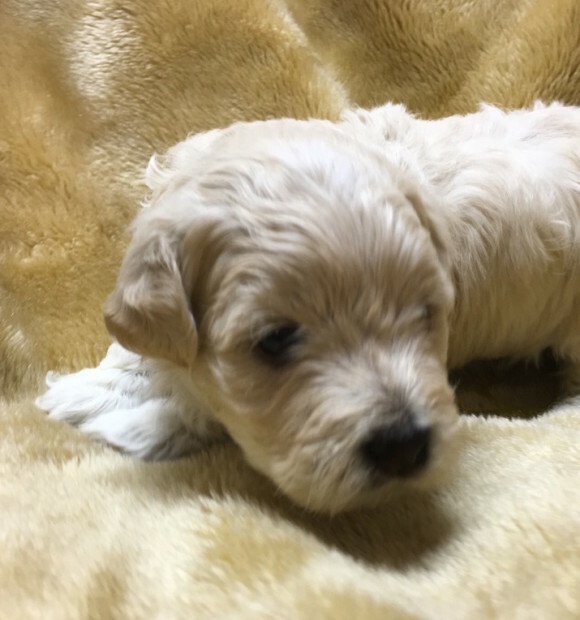 This is our only female pup still AVAILABLE. Bella is moving about with great strength but her eyes are not yet opened. Anytime now!! 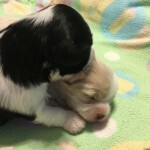 To learn about our pups, our procedures and how to reserve one, give us a call at-314-772-4874. 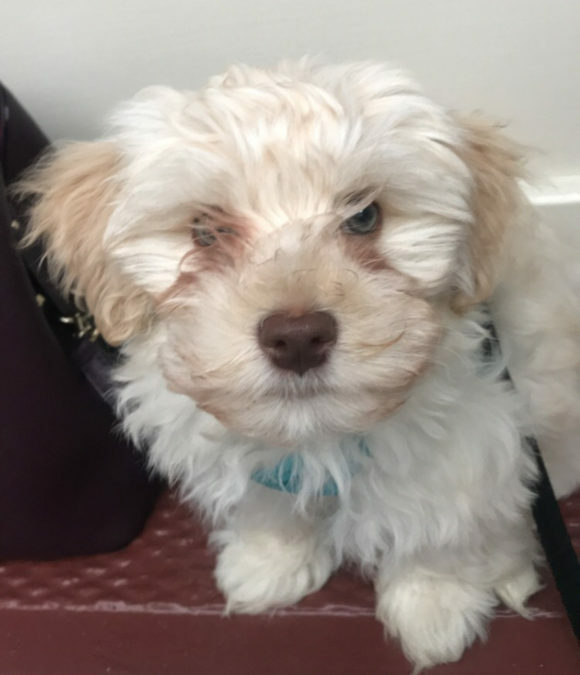 ....................................................... Click Links below to see puppies who live with their "Forever Families"! 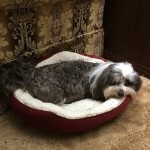 — Comments Off on Ellie’s three boys (Choco’s Tres Amigos) are resting well after having their dew claws removed! Ellie’s three boys (Choco’s Tres Amigos) are resting well after having their dew claws removed! These three beautiful little boys are AVAILABLE. 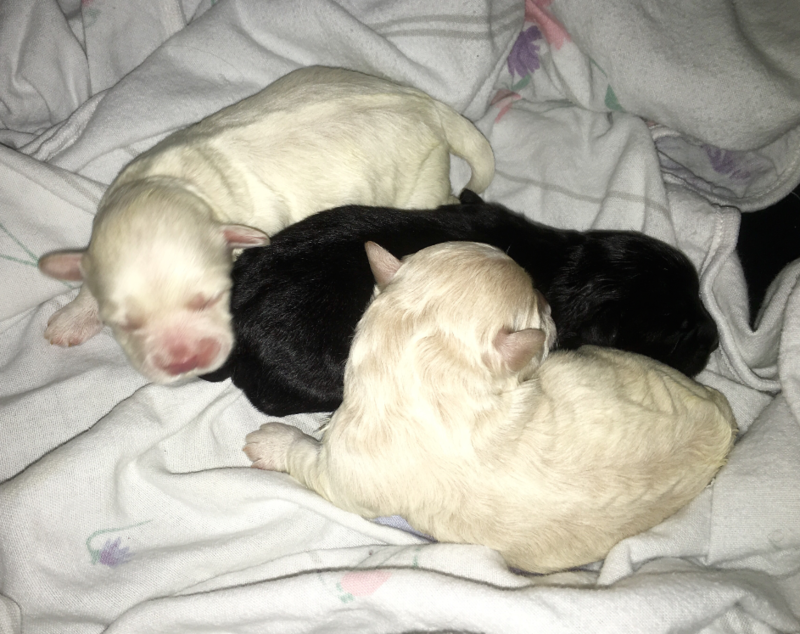 From left to right: Scooter (white), Champ (for champagne), and Tux (black with a white chest). All three are AVAILABLE. 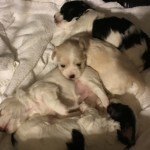 ....................................................... Click Links below to see puppies who live with their "Forever Families"! 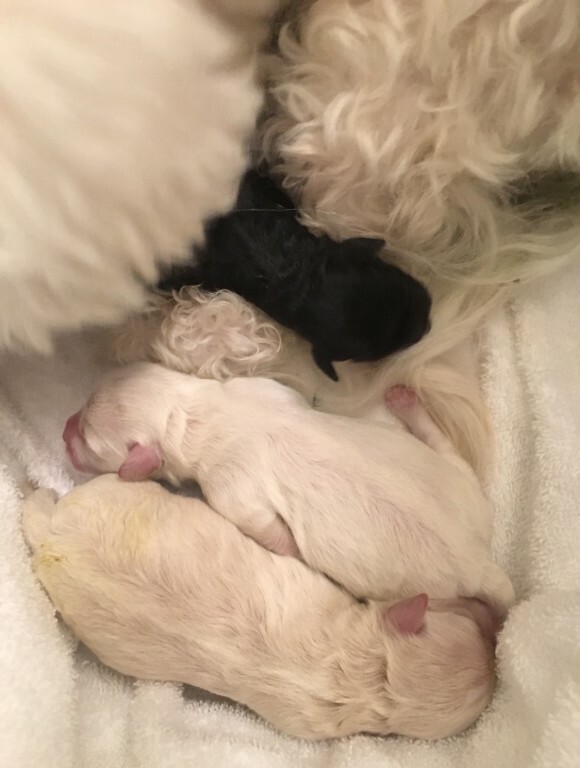 — Comments Off on We are Happy to Introduce Ellie’s & Choco’s Litter of 3! 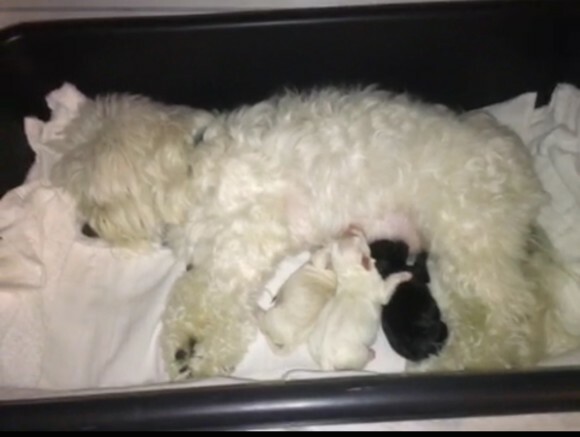 We are Happy to Introduce Ellie’s & Choco’s Litter of 3! 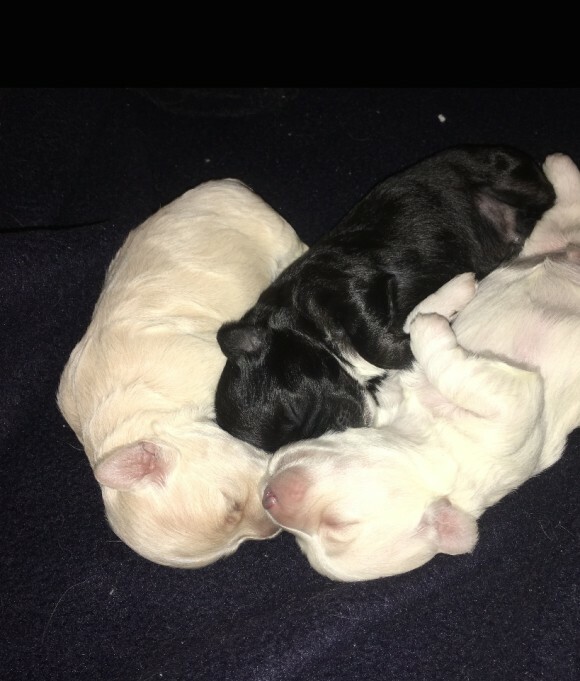 Meet Ellie & Choco’s Three Boys- From top to bottom they are Black, White and Cream. At this time all three are AVAILABLE. For more information please give me a call at 314-772-4874. We will begin to take more photos, but for now, we want all of this little family to have lots of peace and quiet.